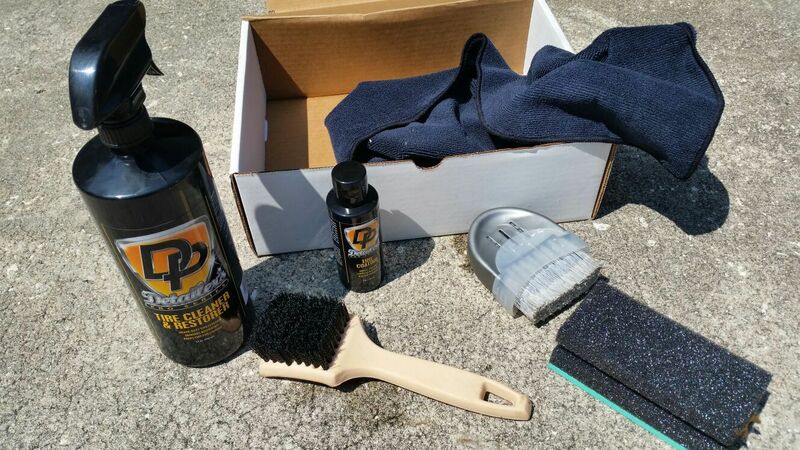 Here is the review of the DP Tire Coating Kit that I purchased from Autogeek earlier this year. I've had the product since March and have used it on three vehicles so far. DP is one of Autogeek's house brands and I've found their products to be moderately priced but producing professional level results over the years. I am not associated with Autogeek in any manner and I'm writing this review independent of any influence from them. Let's start with this statement: I HATE brown tires. I absolutely hate them and over the years I've tried many products to rectify the situation to only have them go brown after a few days or a few weeks for the better products. 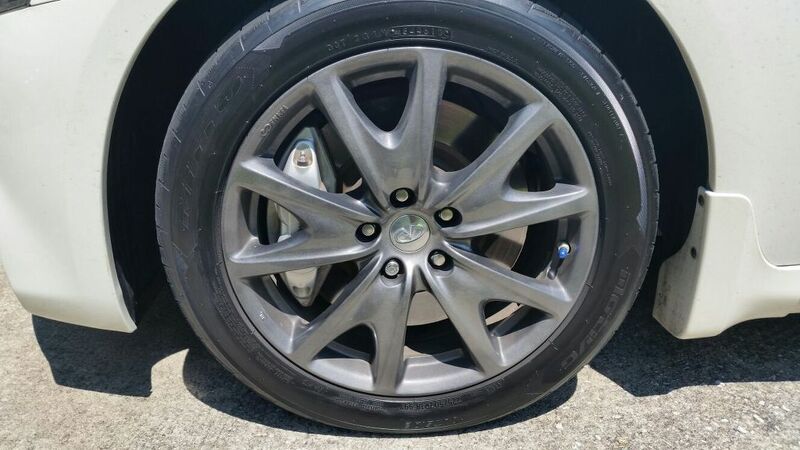 The only successful way I've found to avoid brown tires is weekly washing using Meguire's Tire and Wheel cleaner. This turns rather impractical quickly especially here in the south when either heat in the summer, or light in the winter limit the actual amount of time that you can wash the car. So when I saw ads on Velocity for a new DP tire coating that lasted for months, I was skeptical, but I hate brown tires enough that I was willing to try it, and at $69.99 it wasn't a cheap experiment... but I really hate brown tires, so I actually bought the kit back in Feburary, and it was so popular I actually didn't receive it until the middle of March. My initial reaction to these products was very good when I unboxed them. The bottles are of good quality and the sprayer is typical of the DP series, which is very functional and not a cheap unit (just don't drop them, they are a bit fragile if they hit just right). Both brushes are nicely constructed and look like they'll give years of service. The microfiber towels are very good quality, several steps above what the autoparts places sell as "premium" towels. Overall, considering the price of the kit, I was satisfied with what I got, but the 4oz of tire coating seemed a little off until I realized how little you actually use of it. I think I've maybe used a tablespoon including wastage and spills on 3 cars. There's probably enough in that bottle to coat at least 100 tires. You use the brush and the Tire Cleaner to clean the wheels thoroughly before applying the coating. You do wind up having to do multiple passes if the tires are really dirty, and the brush allows you to get into the pores of the rubber to get all of the dirt out and give the coating a place to bond to. Basically spray on dry tires, let sit for a minute, then agitate with the brush until it foams up, then wipe off with the towels. It does help to clean the brush between passes as it does pull up a LOT of dirt. Allow for the tires to thoroughly dry before applying the coating. They basically say that use one coating and it's more of a matte finish, and then additional coatings add more gloss to the product. You don't need to use a lot with the brush, and the first few times I used it I probably wasted quite a bit by soaking the applicator brush with it first. It has a bluish purple tint to it when it goes on thick, but for the G, I just kept running the applicator brush around the wheel to spread it evenly, so I don't seem to have the same blue/purple halo that the thicker coats on the Porsche wheels have. 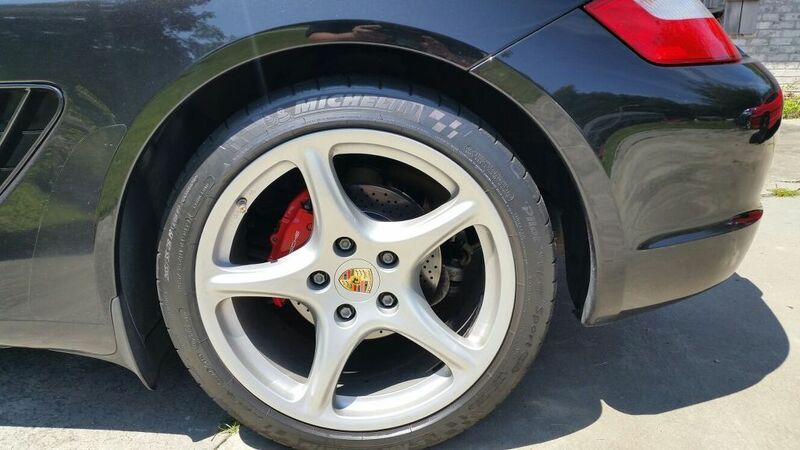 I decided to wait quite some time to actually assess the tire shine... but I'll let the images speak for themselves. 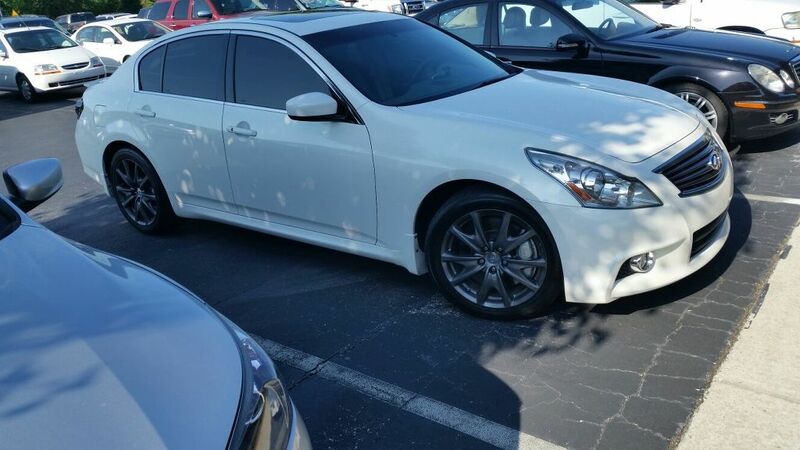 Firstly, here's the latest result, a fresh application on my G37... and I actually had to run out (daughter at mall emergency) before the tire coating had time to fully dry. This is two coats, but applied much more sparingly than they were applied on the Porsche. There's a touch of bluish/purple tinge to the coating, and a couple of areas that could use a touch up due to driving before it dried, but overall it looks pretty good. This is two thick coats done on the Porsche back in March. The last time the car was washed was for a Porsche event 2 weeks ago. This is 5 months old folks. And the only thing that has happened is that it's been lightly cleaned with the Meguire's wheel cleaner and a brush when it's been washed. You can see the bluish purple halo, but that's mostly due to the thicker coat that I used on these tires. The Porsche is garaged, but was daily driven about 45% of the time in the past 5 months, and I'd driven in rain and sun since the car had been washed. And this was the torture test. One coat, on my BMW beater done at the same time as the Porsche. 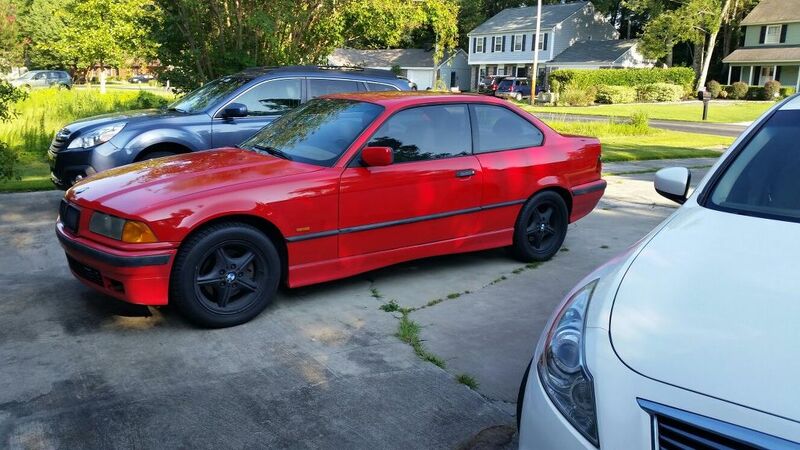 The BMW has clearcoat failure, so I do not wash it very often and the wheels are plasti-dipped, so they only receive a light cleaning when they're cleaned. It was last washed several months ago... probably in May. As you can see, there is a bit of browning due to brake dust, but the surface still has a little bit of gloss. I imagine if I'd washed the tires that the brake dust would've come off and they'd be pretty close to a matte black. The BMW is not garaged and is driven in all circumstances. I decided to add a 10 ft view just to show you what the tires look like from a distance... they still look good. In conclusion, I'd say that the results are quite good, even taking the cost of the kit into consideration. The finish is durable and has held up very well for 5 months and counting. 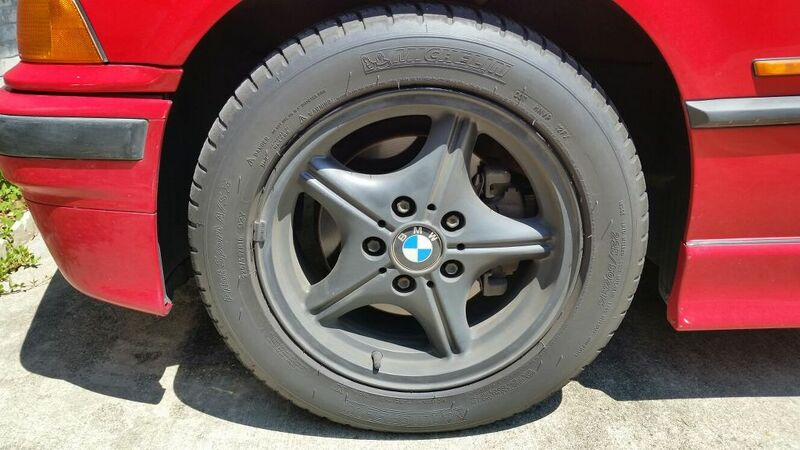 For someone like me who hates brown tires, it's well worth the investment, because even though the close of pic of the BMW tire shows some browning... from 10 feet away they still look like matte black tires. Last edited by WolfSongX; 08-11-2015 at 12:47 PM. Reason: Added 10ft view of the BMW. I was hoping this would address brown tires! Nice review. I feel the same way about brown, which always seemed to happen after tire shine was applied. I've quit using it for that purpose and just give them a good scrub. Will look into this kit if mine go brown after winter. Great review, but I feel Tuf Shine still is the king and I have nothing but success using it. Megs degreaser is a must have, love that product. It strips all the grease off the tires extremely well. I've since picked up bleech-white tire cleaner. It melts the brown and drit right off and makes the side walls look brand new. Have to be swift with that stuff and clean anywhere it could overspray too cause it can screw up paint if not washed off. Should I switch from a wax or sealant, to a coating?